Night After Night: I don't stand a Ghost of a Trance with you. Don't call it a comeback. I don't stand a Ghost of a Trance with you. 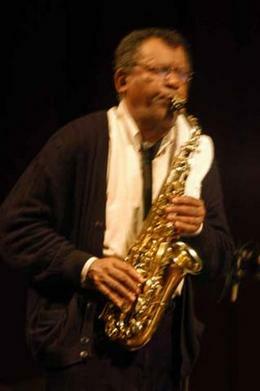 A funny thing happens when a bassist plays one of Braxton's basic eighth-note Ghost Trance Music (GTM) patterns at a fastish clip and lets the notes ring out, rather than clipping them off in a dry staccato: The result is effectively the kind of walking bass line that's animated jazz performances since time immemorial. The sensation that I'm describing arrived some five minutes into Composition No. 353, the work that filled the second set by Anthony Braxton and his 12(+1)tet tonight at Iridium. It followed what seemed like a lengthy, slow-motion prologue that in real time only lasted some three minutes or so. A saxophone-quartet interlude was followed by simultaneous incursions -- the duo of saxophonist James Fei and brass player Taylor Ho Bynum, and the trio of violinist Jessica Pavone, flutist Nicole Mitchell and bassoonist Sara Schoenbeck. And then, bassist Carl Testa broke into a buoyant pulse teamed with rubbery bop runs by guitarist Mary Halvorson, touching upon a conventional jazz mode that hadn't ever surfaced during the previous evening. This segment didn't last long -- there was no danger of this ensemble suddenly transforming into Uncle Tony's Hot Club of Middletown. Yet somehow, it struck a looser, altogether more playful tone that extended throughout the evening. While performance strategies could still defined by the same parameters I described last night, this piece somehow seemed more rhythmically charged. That's not to say it was always busy; in fact, moments of complete silence punctuated the ongoing babble on several occasions. The variety of tonight's set extended to its instrumental subgroupings, many of them combinations that hadn't been struck in the previous set I'd caught. Trombonist Reut Regev, who spent much of Thursday night's second set shadowing Bynum's leads, tonight found more common ground with tuba player Jay Rozen, and combined with Schoenbeck for a series of puckish interruptions later in the piece. Just a bit earlier, Schoenbeck had paired her bassoon with Mitchell's glowing alto flute, resulting in an especially gorgeous blend. Pavone colluded with Bynum; Bynum egged on reedist Andrew Raffo Dewar; Dewar teamed up with saxophonist Steve Lehman; Lehman duetted with Fei; Fei riffed with Braxton. And so on. These incursions actually seemed to scamper across the primary flow of the composition with increased frequency tonight; in addition to the hand signals and quietly mouthed verbal cues, both Braxton and Bynum waved dry-erase boards with shorthand instructions, indicating new tangents. And more of these byways seemed to be based on repeating rhythmic cells -- clusters of five-note patterns played again and again, and stair-stepping melodic patterns that sounded like finger exercises for a student pianist (one-two-three-four-five-four-three-two-one). The jazz thing broke out again about 40 minutes into the piece. Hard to believe, but there it was: Percussionst Aaron Siegel played that familiar "ching, ching-a-ding, ching-a-ding..." on ride cymbal -- although his time waxed and waned like a bebop record warped in a hot car. Turned out that, as had been the case with Testa earlier in the set, Siegel was cutting loose with Halvorson, who plucked larky lines behind the stark horn choir in the foreground. Extended instrumental techniques crept into the latter stretches of the piece with increasingly frequency; Fei and Lehman punched in a duo passage of dry, nattering quacks, while Rozen rattled and buzzed with an aluminum pie plate shoved into his tuba's bell. A tremendously impressive vocal interlude by Mitchell demonstrated lessons learned from Cathy Berberian, Joan La Barbara and Shelley Hirsch. So great were the contributions of his ensemble members that only eventually did I notice -- during his brief, huffing contrabass clarinet passage -- that Braxton himself seemed to have played rather less tonight than he had the night before. It was just then that he uncorked a torrential alto saxophone solo, which somehow just managed to slice through the density of its surroundings. Near the end of the composition, we were treated to a good, old-fashioned drum solo by Siegel; Braxton, shuddering in approval, jumped in with a snake-charming incantation on sopranino sax. It seems my initial enthusiasm was not misplaced: All told, this set neatly eclipsed the one I deemed "easily the most fulfilling Braxton encounter I've had to date" only yesterday. Once again, a table full of disenchanted tourists departed early, and loudly; once again, the crowd was on average rather younger than the Iridium norm. Still, attendance had improved -- I'd guess that it was somewhere in the range of 150 patrons. Jason Guthartz once again manned his camera, and a friend also pointed out that longtime New York jazz chronicler Jon Rosenberg was recording everything. There's absolutely no reason why Sony BMG couldn't at least release those recordings on iTunes, as Universal has done with some rare and out-of-print items from their catalog (like George Russell's Jazz in the Space Age). It would cost them next to nothing. Braxton at Iridium 1, or The man from Utopia. Braxton at Iridium 2, or I don't stand a Ghost of a Trance with you. Braxton at Iridium 3, or That haunting refrain. Derek Bailey: A Longwinded Account of Staggering Company. What are those playlists, anyway?